But this one is really outdoes them all. That's because it actually was built to be a fairy-tale castle. It may look medieval, but it's not. It was built by King Ludwig II in 1869. It's more fun to call him by the moniker he earned with his frenetic building spree... Mad King Ludwig. What building spree? He built two other castles in short order! For Neuschwanstein, Ludwig had the help of a stage designer! 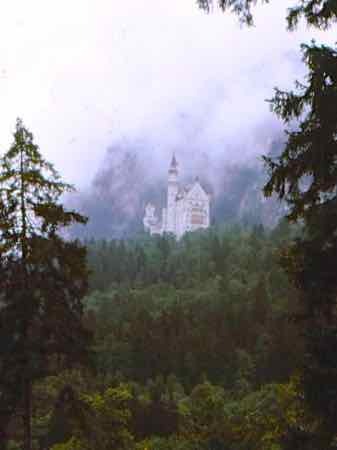 We've read repeatedly that Neuschwanstein was the inspiration for the Sleeping Beauty Castle in Disneyland! Don't just race up the hill to Neuschwanstein. Entrance tickets to the Castle must be purchased at the ticket center in Hohenschwangau. Yes, there are two castles right next to each other. You can't wander the castle on your own; you must join a tour. Tours are given regularly in English as well as German. There are stairs inside... LOTS of them. They do have tours for the disabled. Check their website for details. If you really want to be a smart traveler... get a reservation. It'll only cost you a couple of Euros more to do this. Don't miss your time slot!!! You'll have two tour times on your ticket two hours apart. Especially in the summer. Remember, tours are mandatory... and there are a limited number of spaces on each. If you have to wait for your tour, hike around to see the two beautiful lakes nearby. The Schwansee is a nature reserve offering views of the castles. Just remember not to miss your tour time! The lavish interior is full of fantastic furniture and imaginative wall paper. You can't take pictures inside the castle, but you can get great views outside. Yes, more up... to Mary's Bridge (Marienbruecke) for a great photo op view of the castle. You can make this a day trip from Munich. We did that the first time and visited on a driving trip through Bavaria another time. You can stay in Fussen or Schwangau, the little towns near the castle. You can also choose to stay right in Hohenschwangau. There are a few hotels to choose from near the castles. 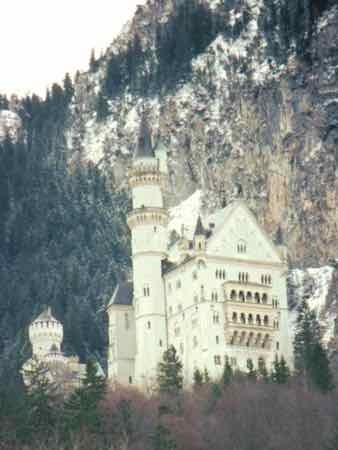 The castle complex of Hohenschwangau is 4 miles (7 km) east of the little Bavarian town of Fussen. The closest airport is Munich; the castle is 72 miles (116 km) from Munich. 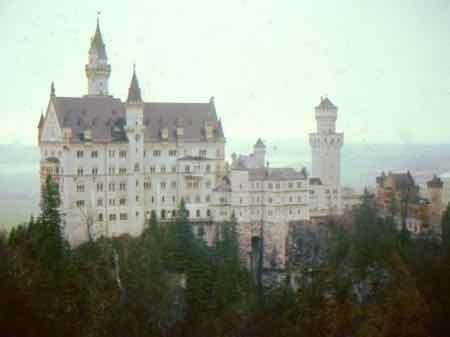 It was opened to tourism only seven weeks after the mysterious death of Mad King Ludwig. No trip to this part of Germany would be complete without a visit to Neuschwanstein!